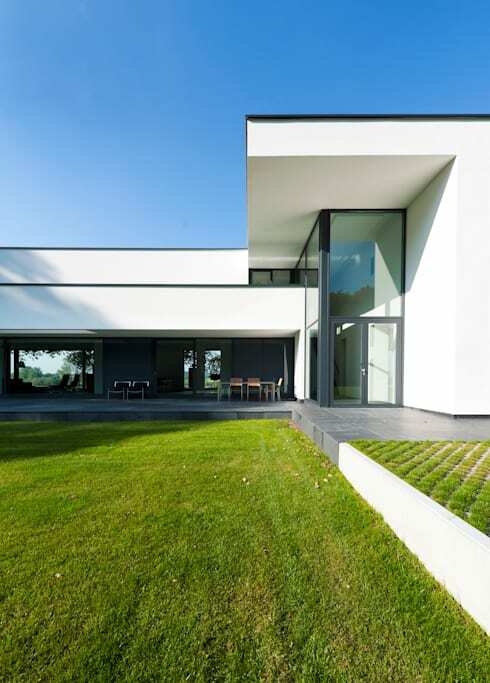 Designed by Netherlands architects, Maas Architecten, this sleek house on the river is all about contemporary style, modern edge and a minimalist look and feel. They take no prisoners in their drive for clean lines, simple design and a modern effect. Set on the side of a river and surrounded by a picturesque landscape, this house encompasses family comfort and beautiful architecture. Why would you want to live anywhere else when this impressive home exists? Esther Meynell once said, Country things are the necessary root of our life—and that remains true even of a rootless and tragically urban civilisation. To live permanently away from the country is a form of slow death. This home is a celebration of country life and of merging beautiful, modern concepts with the joy of the natural. So what are we waiting for? Let's go discover the root of our life! Our first view of this house shows us the impressive volumes that the architects have managed to achieve throughout this structure. They have certainly not had a shortage of space when it comes to the site for their building so they have managed to utilise a rectangular piece of property just in front of the river to get to work—absolute prime real estate! The result is a house the sweeps across the bank of the river in a rectangular shape. The architects have expertly paired white brick walls with glass windows and doors, ensuring that the house doesn't look too solid, chunky or big. This also allows the glass sections of the house to act as a transparent barrier so that the interior and the exterior seem to flow between each other. 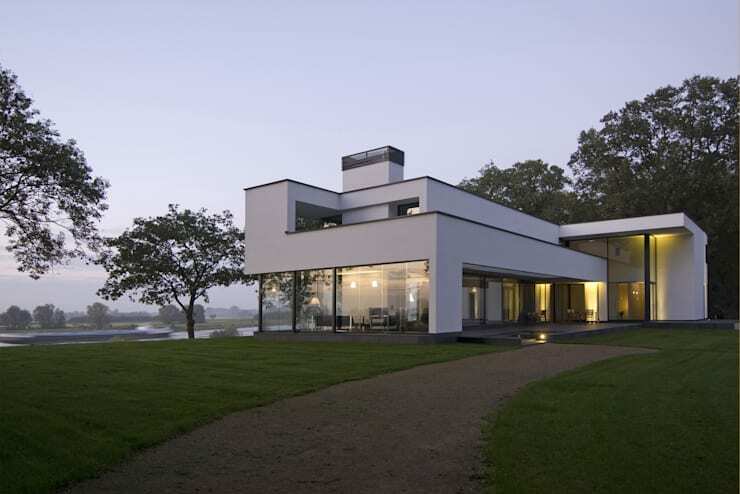 With such gorgeous views, the architects needed to incorporate the home into the surrounds, which is what this achieves. You'll notice that there are no walls around this house either. It's a place of safety, a haven from the grit and grime of a city and a space where one can unwind and relax. Peace and tranquillity are the key words here. In this photograph, the rectangle shape of the house as well as the expansive views are far more prominent. The modern structure contrasts beautifully here with the natural, uninhibited surrounds. The clean, simple lines are incredibly effective and create a refined look in comparison to the wild trees and bushes that surround the property. You'll also notice that the architects have gone for very simple colours and materials—glass and white. They are not interested in a home that is ostentatious or over the top. Instead, they are working towards a subtle and understated kind of contemporary attraction, which they've achieved fantastically. If you have beautiful views like this but you aren't sure how to capitalise on them, speak to an architect or a builder about opening up your home by installing big glass windows and doors. You can also build outwards, creating a fantastic terrace or an upstairs balcony. The options are endless! This view of the house gives us a sneak peek into the house itself, where the large glass doors and windows reveal what is going on inside. We can also see the different volumes and shapes here, which have been joined together to create a very dynamic and eclectic looking building. However, it remains within the boundaries of neat, clean and minimalist, sticking to neutral colours and definitive lines. The garden here is incredible and perfect for any family. The neat, sweeping lawn overlooks the beautiful river and is an ideal place for playing sport, running around and relaxing on the grass for a picnic. If you have a large, sweeping garden like this the opportunities are endless. You can build a swimming pool or you can furnish the garden with beautiful lawn furniture. The open plan nature of this house is also a sign of its modern style, where the whole house opens out onto the patio. You can see the kids playing while you're entertaining guests and you can enjoy the afternoon sunshine, right from your living room! Travelling into the house, we can see the sleek, white minimalist look transcends the exterior and interior boundary, making its way into the inside décor. Sleek white kitchen counter tops and cupboards contrast against dark, charcoal floor tiles, creating a very trendy and modern look. There is no clutter on the surfaces, no messy books piled in the corner and no array of ornaments decorating the shelves. Instead the architects have made the most of smart storage solutions, ensuring that all personal items are out of sight. This is a great option for any modern home and we suggest you use it, especially if you have kids. It's an easy way to get rid of toys scattered all over the place! The tiles are one of our favourite parts of this interior space, adding a deep sense of style and texture to the home. Do you like them? Read these fantastic tips on how to: Enhance Your Home With Modern Tiles. A minimalist modern house doesn't have to be devoid of character or style, however. 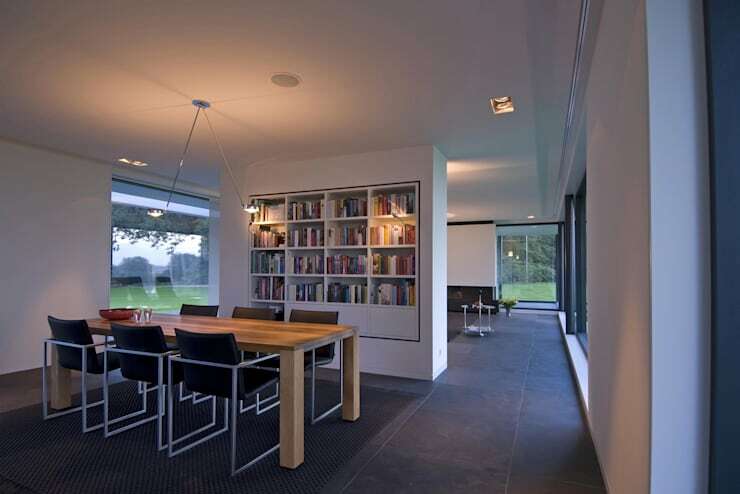 Look at how this gorgeous, simple dining room and book shelf creates warmth and cosiness in this space? The light wood is a great feature when it comes to a dining room table, allowing you to add bold splashes of colour in the form of cushions, ornaments or even the books on the shelf! Lighting is also key here, creating a soft and warm glow in this space. This is a good tip for any home—opt for lamps and dimming lights so that your home has some atmosphere in it at night. No one wants to be eating dinner under huge, bright fluorescent lights! This is a home that exudes a sense of safety and protection, where you can come home from a long day and lose yourself in the countryside, without compromising on comfort or style. It's so beautiful, we want to take a nap in it right now! If you liked this house then you'll love the: Super Modern Home for a Super Lucky Family. Did you like this home? Perhaps it's too minimal and your prefer something more traditional? Let us know in the comments!